Discovered by Lacaille on March 19, 1752. This cluster was discovered by Nicholas Louis de Lacaille when he was in South Africa during 1751-1752. Burnham states this is "probably the finest of the galactic clusters in Puppis," but not in Messier's catalog and many other observing lists as it is situated to much south. However, where it comes sufficiently high over the horizon, it is a splendid rich cluster of over 300 stars, crowded in a 20' field, situated about 2.5 deg NW from 2.25 mag, extremely hot O5 supergiant Zeta Puppis (this star, at 2,400 light years distance, is one of the brightest stars known, with absolute mag -7.1, corresponding to 60,000 solar luminosities). The brightest star of NGC 2477 is of mag 9.81, the hottest of spectral type B8. 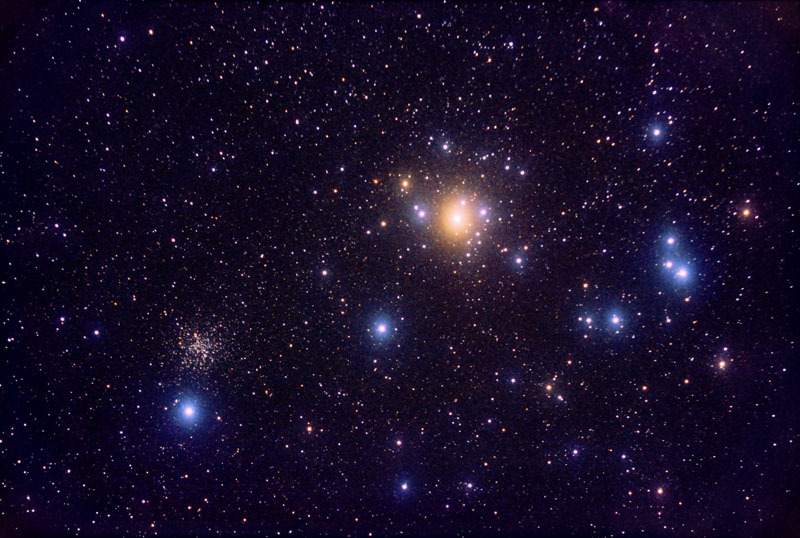 The cluster's age has been estimated at about 700 million years (Sky Catalog 2000.0). The image in this page was obtained by Matt BenDaniel. 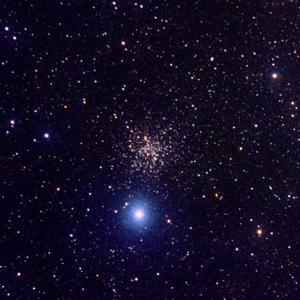 It was cropped from a larger image which shows NGC 2477 together with its much nearer apparent neighbor, NGC 2451. This is a 60-minutes exposure on Kodak E 200 film, taken with a Tele Vue 85 refractor at f/5.6, on December 31, 2000 at 00:23 PST. In the Astronomical League's Southern Sky Binocular Club list. Caldwell 71 in Patrick Moore's list. Investigations of the stars of NGC 2477 has lead, in November 2003, to the discovery of the Canis Major Dwarf, the closest dwarf galaxy to us and our Milky Way.